I was never that into wearing jeans until I learned how to sew my own perfectly fitted pair. 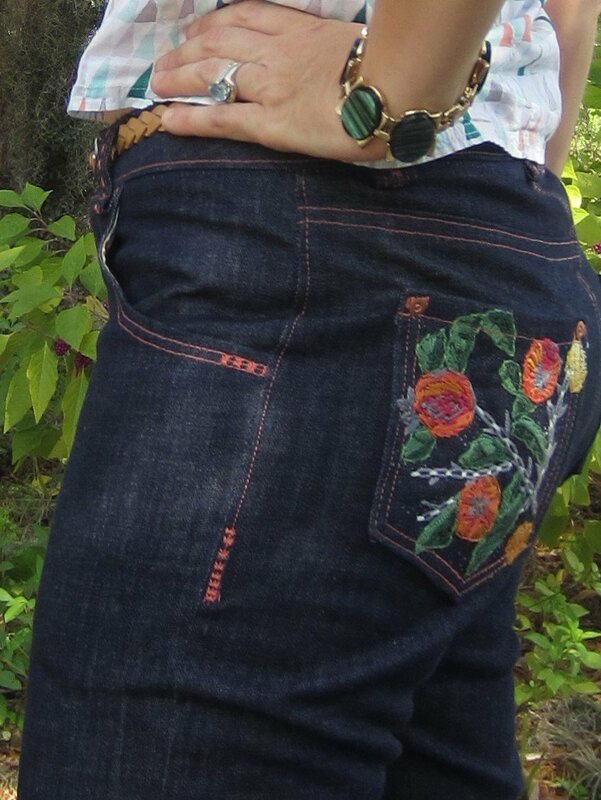 These jeans are just my style with the embroidered pockets and colorful topstitching. I love the fit and silhouette. I’m not a skinny jeans girl. I don’t think that silhouette makes me look as proportional as a nice straight leg that skims the hip. This organic denim is so comfortable too, with just a bit of stretch. 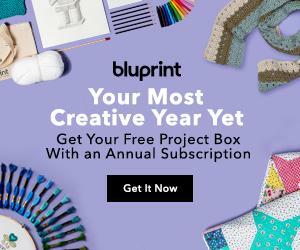 Perfect timing as this month’s theme over at The Monthly Stitch is Denim Never Dies! 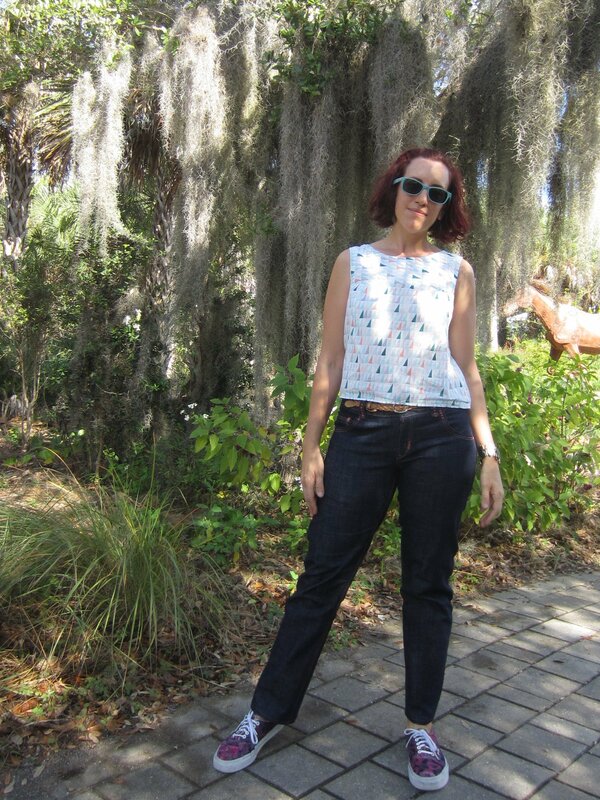 I used Vogue pattern V8774 again, my tried and true pattern that I modified for my first pair of jeans, my sashiko stitched indigo dyed jeans. Only modifications this go around were widening the change pocket and the side pockets to make them much deeper and narrowing the lower leg slightly. 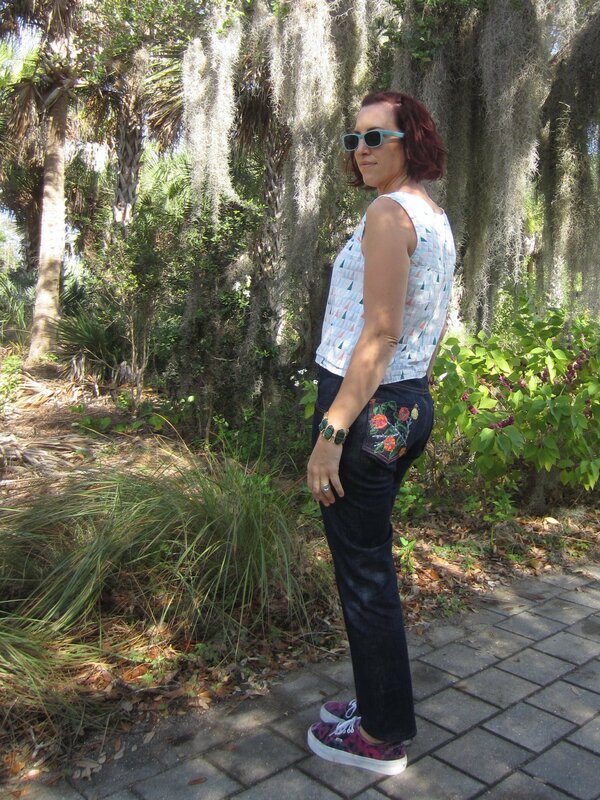 I used Angela Wolf’s Craftsy class Sewing Designer Jeans to make these once again. 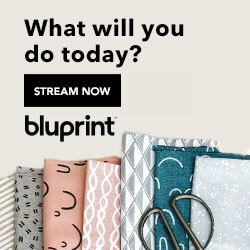 I love her tips and it’s so easy to follow along and sew along with the video lessons. I have been on a search for organic denim for a while now. It’s surprisingly hard to find! This is a stretch denim from Werkundstoff on Etsy(from Germany) in a nice dark finish. I used about 2.5 yards to make these. The denim is quite light weight at just 11.5 oz, and lovely to work with. I highly recommend it! I figured if I’m going to go to all the trouble of making custom denim I might as well go crazy and make them exactly to my taste. I love embroidery and have been looking for a project using my favorite William Morris pomegranate’s as inspiration. I decided to coordinate my embroidery colors of coral, orange, pink and green with my topstitching and serging. I used an orange thread for all my serging on the interior and found a perfect coral silk thread to match my embroidery for the topstitching. I double my thread for all the topstitching and used a 4.0 stitch – no double needles here. 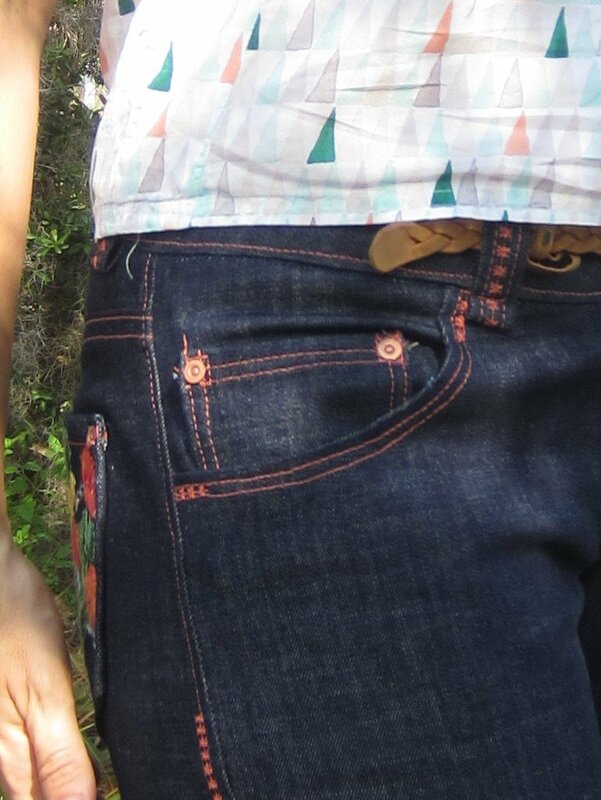 I also used a decorative star stitch on my belt loops and to secure the denim on the pockets, side seam and zipper fly. I went with the copper finish for buttons, zipper and rivets, all from Taylor Tailor’s shop. I’m wearing these with my Anne Klein Top V1382 , my fav purple Batik Vans, Anthropologie bracelet and Zennioptical sunglasses btw. These jeans took quite a while to construct but I just love them. The fit is great plus the dark finish is quite slimming. It also helps that I’ve toned up so much from my 5+ mile walks during the week. I’ve been wearing these pants constantly since I made them. They’re so comfy and I know I need to wear them now before it gets too hot. I’ve already bought some lovely hemp/linen stretch fabric to make another much simpler pair for the spring. I’m planning on widening the leg slightly for that pair. Hand embroidered pomegranate’s and lemons on back pockets and star stitches on my belt loops. These pockets were the perfect project for after Christmas when I was home with the kids. I even brought them to the park to work on and kept busy working on these while watching TV. They probably took me longer to make then the actual jeans. I’m so happy with how these turned out! Front fly and change pocket detail- I made my change pocket wide enough to fit my license/cc inside. Interior pocket made with enclosed front seam, the fabric is folded lengthwise to keep the bottom of the pocket seamless. Next time I’ll remember to cut my decorative fabric pocket to extend all the way to the waistband. Had to include one last shot with Ami as she was so patient with me as I took photos at the Naples Botanical Garden. We had to find someplace a little shady as it was a bit later in the morning and the sun was so bright. She’s my little helper. She stands by the tripod to let me know how my pics are turning out! I think sewing jeans is a bit addictive. Have you tried making your own jeans? I think the process is just so much fun. Happy Sewing! Next Post Birthday Dress + My First of Many Watson’s! I love making jeans. I thought I ran across organic denim source but now I cannot remember where. Argh. Does that denim stretch out much after wearing? I love your hand stitching! This denim holds it shape really well, the pics above were taken on day 2 of wear. I did just see that Organic Cottons Plus just stocked some indigo denim. Thanks so much! These are so beautiful! They are truly unique and you inspire me to really personalizing my next pair. I love your attention to detail and the use of embroidery stars to secure the pockets and belt loops. What a great idea! The pockets are extremely pretty, you must have one of those fancier embroidery machines. Thanks so much! The pockets are hand embroidered but my Singer stylist did the star stitch. I really do love adding the embellishments to make them unique! Wow these are pretty! Beautiful work! Such a unique pair of jeans – beautiful. Your hand embroidery is BEAUTIFUL! You’ve perfected the jeans and they look terrific. Thank you for the pattern suggestion. Have been looking for a nice jean pattern. wow, cant believe you hand embroidered those pockets, very very pretty! wow, beautiful details! the fit is spot on too, great job! I have the Ginger Jeans kit and really want to make the high waisted version but have never sewn jeans before and am certainly intimidated, but this is a nice nudge toward confidence! Your jeans look awesome and I love the embroided pockets. So if I say I’m not a jeans person, it’s just because I haven’t made myself the perfect pair. Does that mean it’s a quest to embark upon? These are amazing! I love the top-stitching and the pockets! One of a kind. You are so right about making jeans being addicting. After I made the first pair I had to have a second so I’d have one to war and one to wash. Then I thought of things I could do better or different and now…I love the idea of the CC coin pocket! I will incorporate that into my 6th pair.